Space rocks hitting Mars excavate fresh craters at a pace of more than 200 per year, but few new Mars scars pack as much visual punch as one seen in a NASA image released today. 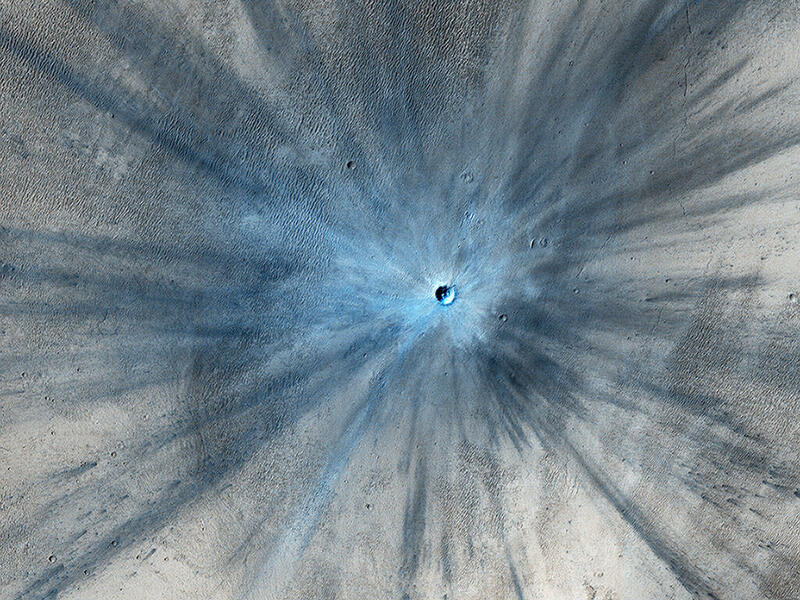 The image from the High Resolution Imaging Science Experiment (HiRISE) camera on NASA’s Mars Reconnaissance Orbiter shows a crater about 100 feet (30 meters) in diameter at the center of a radial burst painting the surface with a pattern of bright and dark tones. It is available online at http://uahirise.org/ESP_034285_1835 and http://photojournal.jpl.nasa.gov/catalog/PIA17932. This entry was posted in Mission News and tagged crater, impacts, Mars, Mars Reconnaissance Orbiter, mission, MRO, NASA, spacecraft on 2014-02-07 by Heather Dalton.